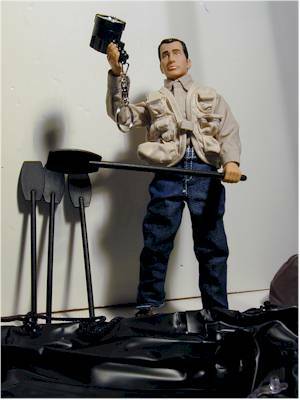 There's a new company getting into the sixth scale market - Action Toy Gear. They are a new startup specializing in accessories and vehicles for 12" figures. 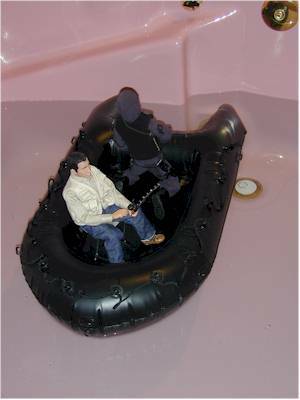 Their first entry is the Combat Assault Raft, based on the rafts used by Special Forces. The raft measures about 27" long and 14" wide. The literature says it will hold 6 - 8 figures, but 8 is pretty crowded. It will hold 6 nicely, and I bet it would float easily under that weight as well. The raft comes with 4 paddles, a repair 'kit', a nylon carrying bag, and a hand held working spotlight. The suggested retail will be $29.99, but it's not yet on the market. Think of this review as a 'preview' review! Bob the fisherman will be helping out with this review - say 'hi' Bob! His buddy Rob the para-military type, will also be helping out. I can't say much at this point about the packaging, since it's not ready yet. I received mine in a small white box marked 'market sample', but I've been told that it will be packaged in a window box. The nylon carrying case is the first thing I saw. The quality and construction are extremely good, with great stitching, a high quality sixth scale zipper, and four rope loops on the exterior so that it can be carried or hung in a variety of ways. The hand held spotlight, intended to aid in those night raids, works almost too good! It's extremely bright for it's size, and I had spots in front of my eyes for awhile after foolishly staring at it as I turned it on the first time. I was quite surprised at how well the light worked, and the batteries are replaceable, of course. It's also set up as a key chain, if you wanted to carry it with you. The four paddles are basic, but accurate as far as I know. Nothing fancy here, as form follows function. They are well made, and will hold up to play. The last accessory is the advertised repair kit, which is pretty much just a small sheet of sticky vinyl. If you get a puncture, cut it to size and apply. 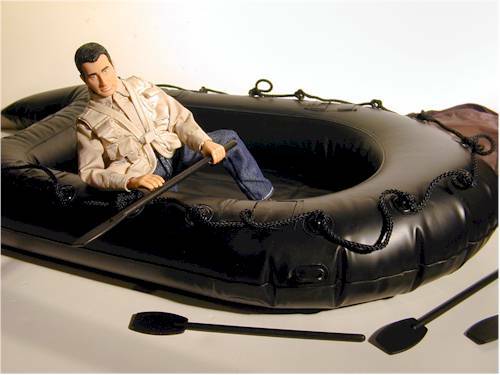 The quality of both the accessories and the raft itself is extremely good. All the seams were very straight and sturdy on mine, with no sign of any weak areas or likely spots to break down. Around the top of the raft are 17 hard plastic D-rings. Most of these are threaded with a long nylon rope, obviously used in real life for handling the raft and tying it off. A couple in back are open for your creative purposes. There are also five hand holds around the outside, designed for figures to carry the raft inflated. All the D-rings and handles are attached in the same manner as the seams - they appear to be heat sealed rather than glued. It is very unlikely that these will come loose. There are also eleven vinyl 'loops' around the top, three at the back and four on either side. I'm not sure of the purpose for these - perhaps for the paddles, or perhaps for other equipment. They are also seamed, and not glued. The inflation valve is in a relatively inconspicous spot in the inside back. It was pretty easy to fill with lung power, and I'd recommend that to avoid overfilling. I left the raft inflated for a couple days, and noticed no loss of air. Obviously, that's a great sign for display purposes. After checking it all out on land, Bob and Rob decided to take the raft for some aqua maneuvers. While they had different ideas of what that really meant, they both got a lot out of it! 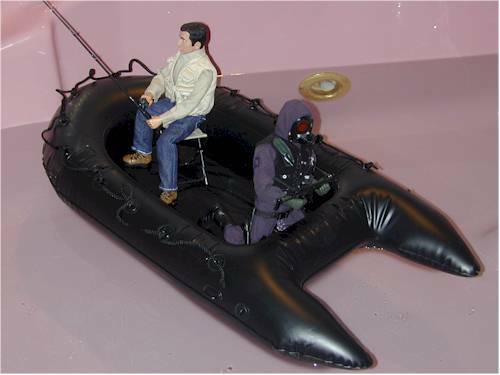 I had no trouble setting the figures up in the raft, and getting them to stay stable. Bob is even sitting on his folding chair, while Rob is on his knees at the back of the raft. I'm sure that four to five figures would work work perfectly in this raft, although above that might cause some flotation problems. I don't think that's an issue though, because four or five figures would look the best. This is a big raft, and you really can't appreciate that fact until you see one in person. It floated great in the bathtub, and is very stable. While most adult collectors will probably be displaying it on dry land, kids could get a tremendous amount of play with it in the tub or better yet, the pool. The only real fault here is the price - at $30, it is a little steep. I'd like to see this at around $20-$25, but I also realize that Action Toy Gear is a new, small company, and their costs are going to be much higher than a Hasbro or even a bbi. Therefore I'm cutting them some slack on the price, and giving them a better mark than Hasbro might get for the same product. If you're looking to set up a Special Forces display, this is an excellent addition. Considering the cool figures coming out right now from Dragon and bbi that also fit this theme, the timing is certainly right. Right now that's pretty limited. They are going to start working with various retailers once the packaging is finished, but you can pre-order directly from them at a temporary web site - http://home.ix.netcom.com/~actiontoygear/index.html. 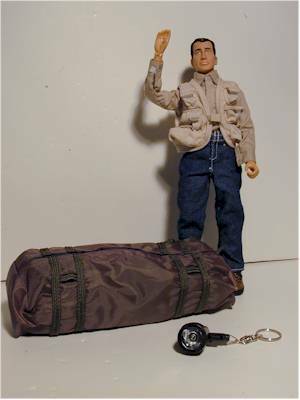 A much better and detailed web site is being constructed at actiontoygear.com, but it's not yet ready for prime time. You can order by email directly from the company right now. The email address is actiontoygear@ix.netcom.com. As I mentioned earlier, retail is $30 plus $4 for shipping.